Picture Frames in Mahagony Finish Displays 8" x 10" and 10" x 12"
These picture frames, also called photo holders or tabletop displays, are made with an easel backing to accommodate any portrait or landscape style pictures. Place these picture frames on your book shelf, desk, piano top or on the wall to treasure and appreciate those special moments. 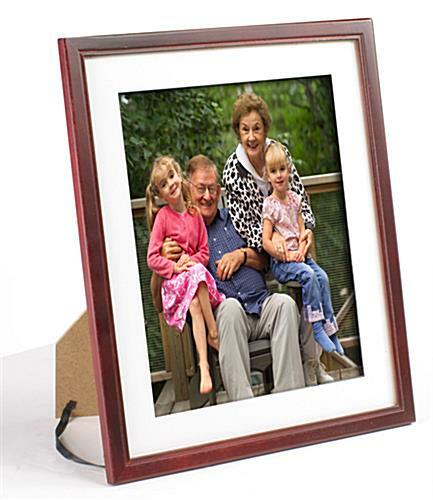 Each picture frame comes with a glass cover so that photographs will be securely sheltered from dust, dirt and damage. 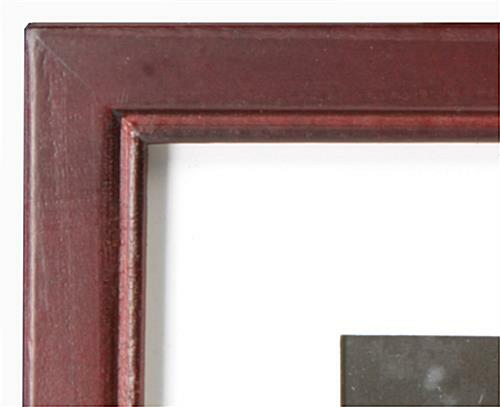 We also provide these picture frames with mounting clips for a wall-mount preference as well. The photo holders, picture frames are offered in a rich mahogany finish. Sold at an affordable price, these picture frames are an ideal alternative to photo albums and boxes. 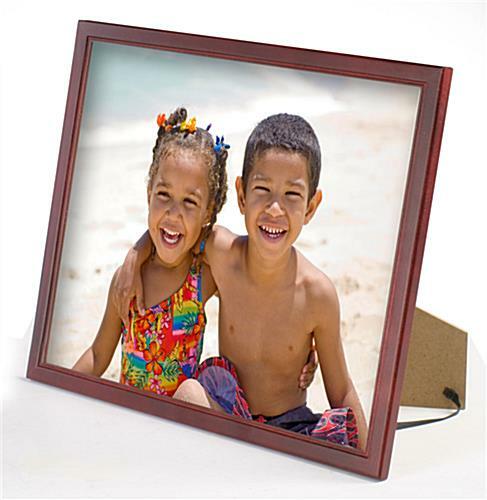 These picture frames are uncomplicated, yet have a modern appeal perfect for showcasing pictures of family and friends. Produced from poplar wood, these picture frames can survive for many years to come. Including a removable mat, these picture frames give you the choice to exhibit any 8" x 10" or 10" x 12" images. Display your best piece of art, snapshot or certificate inside these picture frames. 11.0" x 13.0" x 0.375"
8" x 10", 10" x 12"
My order was shipped promptly, but there were blemishes on the frame. I touched them up as best as I could, but they are still noticeable. The picture frame was well packaged and the cost was very reasonable. I didn't have the time to complain to Customer Service and go through the ordeal of sending it back, etc. We're sorry that your frame had some damage, Don. A customer care representative will contact you promptly.